I have tried my hand at a couple Berliner Weisse recently with varying sucess, all have been no boil with different methods for souring. My first attempt was Lacto pitched with WLP001 after chilling, the resulting beer was not sour at all and just quite bland. Before I tried my hand at the style again I consulted Jimmy, one of the owners of Philly Homebrew Outlet, since brews the style often with great sucess. 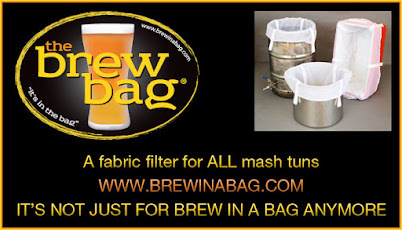 His process is no boil, sometimes mash hopped, chilled to 100f then add a handfull of uncrushed Pilsner malt directly into the fermenter to culture the natural Lactobacillus (among other yeast and bacteria I am sure) living on the outside of the grain kernels. Then he pitches a clean fermenting ale yeast (WLP001 or similar) 24-48 hours after souring. So we tried one of his that was around the shop and it was great, very sour but refreshing, I enjoyed it so I figured I would try his method. I was a little bit concerned though because it is really difficult to control the sourness being that you dont know what you're going to culture from those grains, similar to a sour mashed i suppose. I brewed the 10 gallon batch at a friends house with both of us taking 5 gallons home, he went with the commercial lacto/WLP001 approach (which didnt fair too well, never got sour and was a bit one dimensional . Brewday was pretty straight forward, we mashed at 148f, mash hopped with 1 oz Tettanang, batch sparged and ran off right into the carboy. I sealed it up, drove it home and stuck it in the basement to cool down a bit. 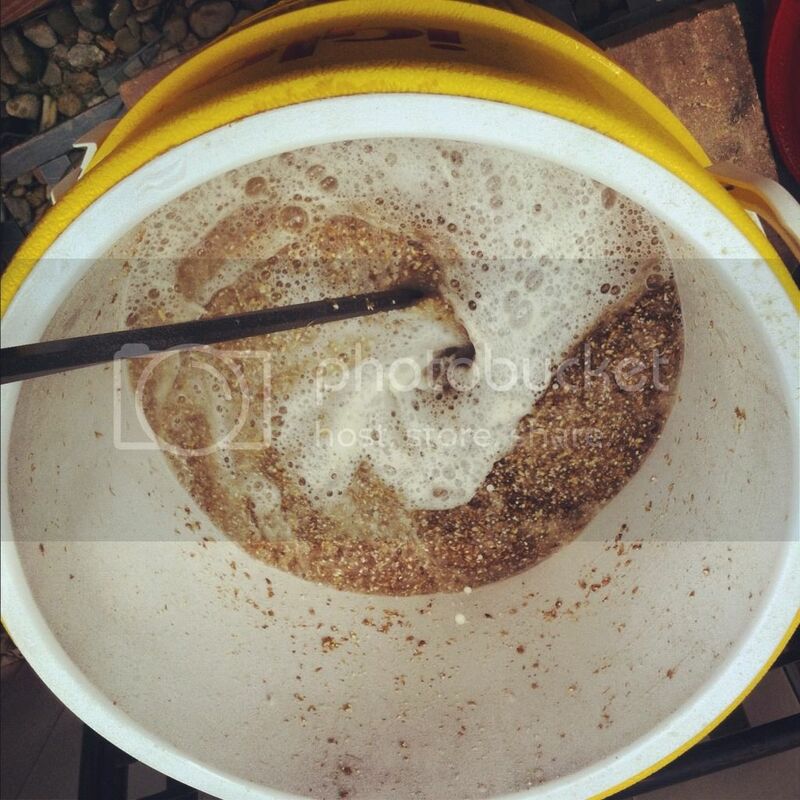 Using a Paint stirrer on the mash. No dough balls! Checked 2 hours later and the wort was at 108f so I tossed a handfull of uncrushed Pilsner malt into the carboy. 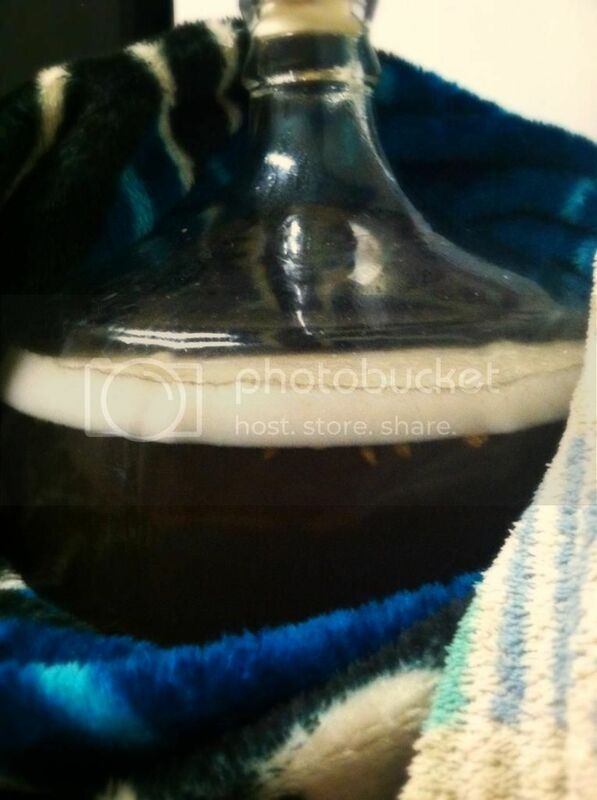 To keep it warm I placed the carboy on a heating pad set on low then wrapped it in a blanket, the heating pad kept it at 100f for 48 hours perfectly. After about 8-12 hours I could see activity, there was a thin white krausen on top of the wort and it was putting off a ton of sulfur. At 48 hours I pulled a sample to check the level of acidity, it was VERY sour! So sour that it made my mouth pucker even with the residual unfermented sugars. I moved the carboy into my cold basement and crashed it to 60f in only 6 hours and pitched WLP029 to finish off fermentation. It took off over night and finished a day later. The beer sat in primary for 14 days until I had an available keg to transfer to. While racking the beer I took a gravity reading and drank a sample, the beer was bone dry at 1.002. The aroma was a bit off putting, a bit of cooked corn and yogurt. In an attempt to clean up the off putting aroma I tossed in the dregs of a recent Brett Trois Saison I brewed and stored the keg away at room temperature to age. 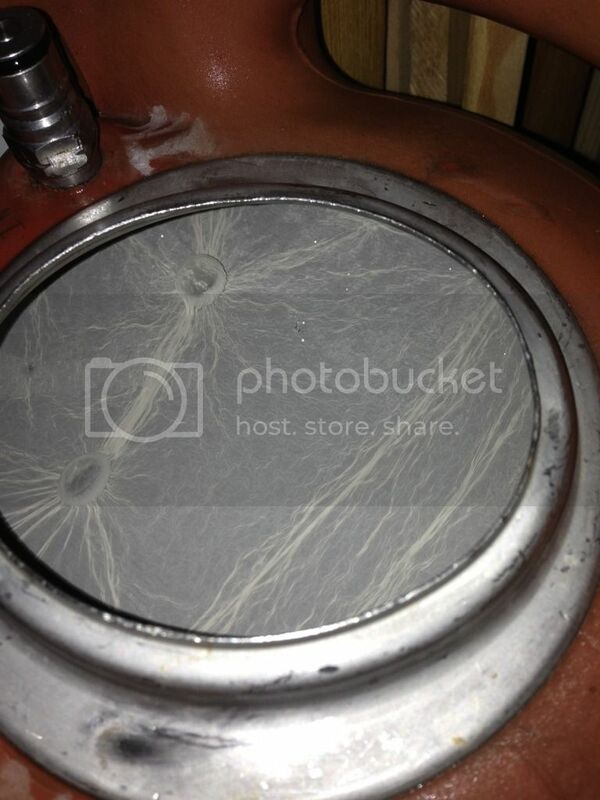 After 2 months in the keg I popped it open, I vented it periodically but there wasnt much activity if any, and saw this nice little pellicle. I took a sample and the aroma that was ruining this beer was almost completely gone, I could still pick up on it but very very faintly but either age or the brett addition worked. so finally about 3-4 months it was finally time to carb and tap this beer. Appearance: Light straw yellow, slightly white, almost like a moderately cloudy lemonade. Aroma: Grainy and very lactic. Taste: Massive acidity hits the tongue immediately, very very sour making the back sides of your pucker. Very thin bodied, but to style. The finish is wheaty and tart. Overall this beer really came around with time but ended up overly sour, I enjoyed it in small 8oz tasting glasses from time to time but it was just too sour. All of the other characteristics of the beer were great, so I think I will tweak this process for the next round. One thing to note is that I got no character from the Brett Trois dregs, in hindsight I will let it age out for another month and re-evbaluateI did a bit of blending at the tap on this one to cut the acidity and thought it was great, 3 parts Berliner to 1 part Naked Golden Saison did the trick. No Boil Berliner Weisse, a small mash hop adding few IBUs, drained right from the mashtun to the fermenter and sparged to full volume. Threw in "1 small handfull" of uncrushed Pilsner malt at ~108f, keep warm for 48-72 hours, taste for lactic sourness. If sufficient, pitch starter of WLP029 ferment cool for 1-3 months and bottle/keg. I've been tempted to do this, but I'm more interested in a 7-10 day turnaround. I may just use a huge lacto starter rather than the grains.Hmm.